So, in my quest to build a roaster (someday), I have thought, how useful would it be to be able to detect the cracks? Well, that remains to be seen, but the other day, I was at a party and ran into a friend (and fellow homeroaster) who showed me an app for his iPhone, that I immediately went and downloaded. It is an audio spectrum analyzer which gives a waterfall display. Now, the accuracy of the iPhone's built in mic leaves much to be desired, but it's an interesting tool nonetheless. 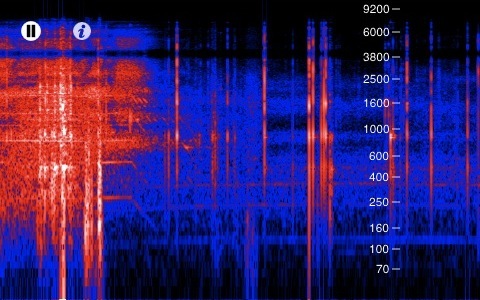 Anyway, here are some spectrograms of my HG roast of 250g of Oriente:http://www.radioactive.org/pix/First.jpgMore cracks are visible. Again, on the right is where I shook the basket.http://www.radioactive.org/pix/Coasting.jpgHere I turned off the heat gun and coasted a little bit before starting cooling. ">http://www.radioactive.org/pix/Outlier.jpgBlue is low level, red higher level, and white is higher still. 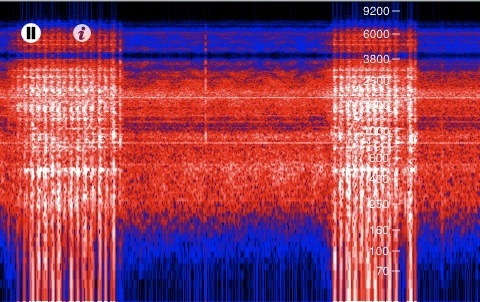 There is a frequency scale on the right which is largely obscured, but more visible in other spectrograms I took. The first crack is shown in the middle, to the left and right is where I was shaking the fry basket and bowls that I use to roast in. The red background is the noise of the heat gun.http://www.radioactive.org/pix/First.jpgMore cracks are visible. Again, on the right is where I shook the basket.http://www.radioactive.org/pix/Coasting.jpgHere I turned off the heat gun and coasted a little bit before starting cooling. Which ones are the cracks? Wow, the Cracks are really outstanding and obvious! The cracks are the vertical blips that stand out by themselves. It's a scrolling chart, which scrolls from right to left; most recent sounds are on the right, older sounds scroll out on the left. The vertical blip in the middle ofhttp://www.radioactive.org/pix/Outlier.jpgis a crack. force me to buy an iPhone! the cracks are approaching, and do it by the seat of my pants. "Blue is low level, red higher level, and white is higher still. 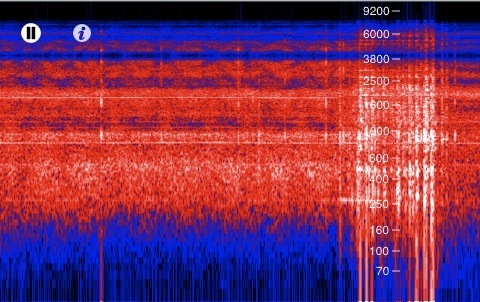 visible in other spectrograms I took. The first crack is shown in the middle"
"I've noticed whooshing noises that precede first crack. I'm not sure if it's part of first crack or just something leading up to it. It sounds like gas jets expelling from the beans, but not like cracks." We're roasting by sound now, not time/ temperature profile? Me too. like pouring water in a cup of ice cubes. until you've coasted a mile down the road. Sounds + + Ungood.